This article may contain affiliate links; there's a possibility I could earn income when you click through one of these links and sign up for an account, make a purchase, etc. This article is written for entertainment purposes only and should not be construed as financial or any other type of professional advice. Enterprising investors often review financial statements to evaluate businesses for potential investments. They may use these numbers to calculate the value of a company and determine its ideal (or target) per-share value. However, an investor should grasp that a) economic value is difficult to ascertain with an accurate set of financial statements but also b) financial statements can be inaccurate or misleading. This article is part of a series on Understanding The Intelligent Investor. Read a review of Chapter 11 by Joseph Hogue, CFA. In Chapter 12 of The Intelligent Investor, Things to Consider About Per-Share Earnings, Benjamin Graham puts the meaning of a single year's earnings and per-share earnings in their proper contexts. He urges investors to weigh a company's long-term record and long-term prospects more heavily than short-term activity. There are two main aspects of EPS to consider: 1) earnings and 2) the number of shares. Executives may have the capability to manipulate both earnings and the number of shares. This capability can lead execs to fool current shareholders or potential investors into thinking that things are going better (or possibly worse) than they really are. These may be called non-recurring charges, extraordinary charges, non-recurring events, etc. One type of special charge is the cost (or earnings) of discontinued operations. For example, a big-box retailer that serves the masses could decide to open boutiques that serve the ultra-wealthy as a pilot project. If the profits generated from these stores don't outweigh their costs (or the return on investment is not as high as desired), then the retailer may decide to close the stores. The cost of running these stores could then be classified as earnings (or losses) from discontinued operations. There's nothing inherently wrong with segmenting earnings of continuing and discontinued operations. But the investor should be aware of this practice. In addition, an investor should understand that companies may time the reporting of losses associated with special charges to its advantage (and possibly the disadvantage of the unsuspecting investor). The tax benefits of these losses may carry forward for several years but not represent the tax liability on an ongoing basis. According to Graham, execs may anticipate future losses and write them off in order to avoid assigning losses to a specific year. This approach may seem useful in dark times when the economy seems to be faring poorly and the stock price is already down. In subsequent years, such as when the market recovers, the company can report earnings and earnings per share growth because of this past one-time ding to the profit-and-loss statement. As a result, the stock price may increase based on strong earnings. Alternatively, a company's leadership team may decide to claim losses in an otherwise strong year in order to reduce earnings and keep the stock price down. This tactic may seem strange but could allow company to maintain a more stable stock price and more cheaply buy back shares. Changes in accounting methods may result in a one-time charge to income statements. This number may be included under special charges or a similar heading. For example, a company may change its depreciation method or inventory valuation method, resulting in a one-time accounting entry. This entry could affect the income statement and balance sheet. Past statements may be adjusted or restated to reflect updated accounting methods. In the commentary, Jason Zweig discusses how accounting practices can affect the truthfulness of income statements. One major area of questionable behavior has been revenue recognition. Recognizing revenue may seem simple but can be complex (and ripe for manipulation). As a simple illustration, if I run a cash-only lemonade stand, I'd recognize revenue whenever I make a cash sale. But if I landed a contract to operate my stand at sporting events over a couple of years (with perhaps a guaranteed minimum), then I might be tempted to recognize revenue when I closed the deal and signed the contract instead of when I received payment for services provided. Aggressive booking of revenue is one of the things that led to inflated earnings and stock valuations in the tech bubble and subsequent crash. For example, Lucent had to reverse revenue the company had previously recognized, leading to a cascade of problems that moved large shareholders from millionaire to pauper status very quickly. Revenue recognition issues common among tech and related companies were addressed by the Security and Exchange Commission (SEC) through Sarbanes-Oxley (SOX) legislation. Still, companies have found ways to represent their earnings in a way that may be considered fraudulent or misleading. A couple of recent situations include failure to recognize expenses clearly linked to revenue (see the SEC's news release about Monsanto and article about Groupon). For more on accounting gimmicks and fraud, see this video on the CFA Institute's website. Dilution happens when the number of outstanding shares increases and dilutes the value of individual shares. Earnings per share can also be diluted; the more shares, the lower EPS. For example, if a company with 1,000 of outstanding shares produces $100,000 in earnings, then earnings per share (EPS) is $100 ($100,000 / 1,000 = $100). However, if the company issues an additional 500 shares (for a total of 1,500 shares), then the EPS is $66.66 ($100,000 / 1,500 = $66.67).Investors often use EPS figures to determine a business valuation and establish a share price that's reasonable. Graham warns investors that EPS could be misleading if the number of outstanding shares is not properly represented (or is diluted). The possibility of an increase in shares may not be obvious. An investor may need to hunt for information suggesting the strong possibility that new shares may be issued — perhaps through 1) public offerings of common stock; 2) convertible preferred stock (which can be converted to common stock); and 3) employee stock options offered as compensation (but not yet claimed). Investors may consider looking at earnings per share – diluted when running their calculations. At every turn, Graham seems to dissuade investors from using earnings as a method of determining stock valuation. In Chapter 12, he seeks to warn investors about relying on single-year earnings in particular. Since the time that the book has been published, new rules and reporting methods have been implemented that (should) increase protections for investors. For example, through Sarbanes-Oxley, the SEC requires CEOs and Chief Financial Officers (CEOs) to certify the accuracy and completeness of financial statements. A glance at income statements indicates that EPS is reported using diluted shares. Sadly, though, publicly-traded companies may still violate these rules or find loopholes that can mislead investors. In addition, foreign companies may not have similar requirements in regard to reporting financial results. Graham offers the solution of reviewing seven to 10 years of financials (not just one year) to gain a more complete and accurate picture of a company's performance. 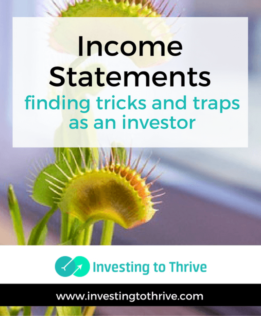 I also look at cash flow statements, which may be a truer representation of financial activity than income statements, and balance sheets to note any quirkiness. For example, if revenue increases dramatically on the income statement and accounts receivable increase on the balance sheet, then I may wonder if the company is loosening its credit standards in order to generate sales. Such a tactic may work in the short run but could cause problems in the longer term. My oldest son, who likes numbers but tends to look at qualitative measures, often focuses on the integrity of the CEO. Having read this chapter of The Intelligent Investor and considered how fraudulent activity can wreck investment performance, I am starting to recognize the benefit of this approach. So, in addition to scrutinizing financial statements, I'll pay more attention to the behavior and honesty of chief executives. You're willing to make the effort to invest in your knowledge in order to grow your wealth. Beef up your investing journey with The Intelligent Investor.